The park was established in the 43rd year of Meiji Reign Period during the Japanese colonial period in the name of "Chiayi Park." The name was once changed to "Zhongshan Park" after the KMT government arrived at Taiwan, but was reinstated in 1997. 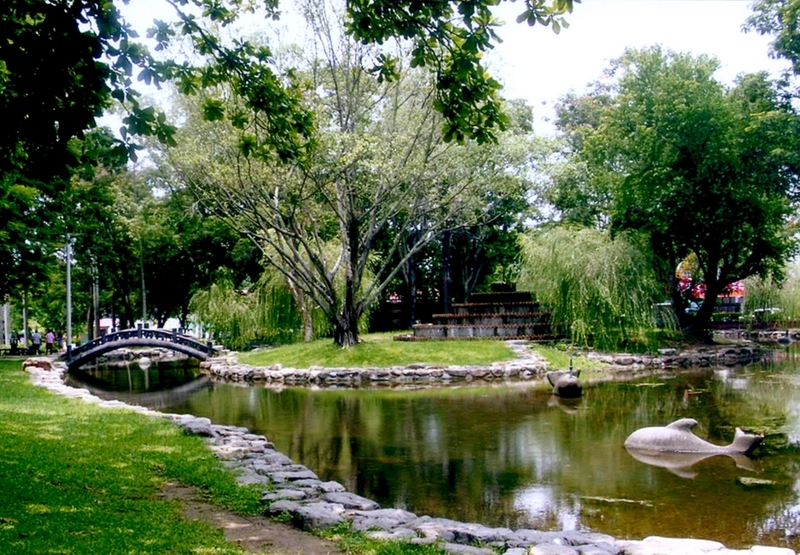 Chiayi Park is located in the suburban area of the east Chiayi City. It was first developed along the hilltop landscape. Later, vacant lands to its east and west were included into the park and bridges were constructed and roads built. The park's current measure of area is over 268,000 square meters with tall old trees, waterside pavilions and houses on the terrace, fish ponds rockery decorations, and winding pathways that lead to secluded corners in the park. The design of the park makes good use of the original natural landscape of the area to create tasteful scenery and a free and unfettered ambiance. There are many historic ruins in the park, including Martyrs' Shrine, Chiayi Tower, Fukang-an monument, Bingwu Earthquake monument, 12 ancient cannons, Chen Chengpo Easel, the way of the wall, Yijiangshan monument, Confucius Temple, and the national treasure of Mt. Ali Forest Railway No. 21 Steam locomotive, making the park a good place to visit for the general public. 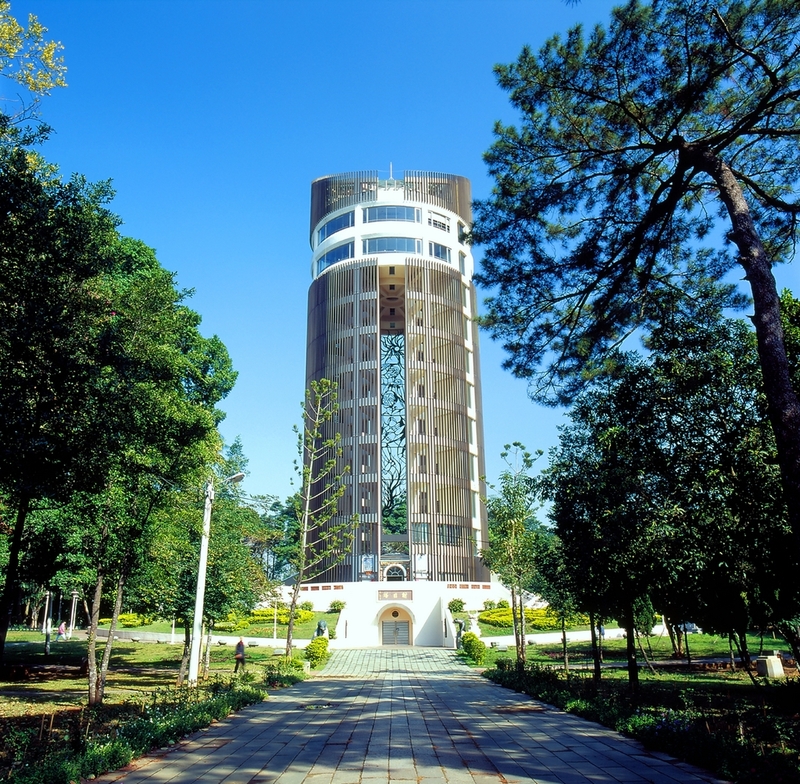 In addition, the densely wooded forestry and agricultural research institute branches in the northeastern corner of the park boast a wide variety of tropical plants and are worthy of a visit. At the height of 62m, the design of the tower was inspired by the giant trees in Ali Mountain (Alishan) with the brownish aluminum stripes symbolizing the texture of the giant trees' outer surface. There is a 40 meters tall "one-line sky" in the middle of the tower and a bronze sculpture that originates from the "sun shooting myth" of the aboriginal people. This beauty myth symbolizes heritage of human beings and reveals the spirit of carrying forward the cause and forging ahead into the future and conveys good meanings in a social/educational sense. A pair of copper sculpture clouded leopards, which symbolize the tutelary god of Formosa, stand at the entrance of this tower. Martyr's Shrine is located at the bottom layer of the tower, while the tower top is equipped with a cafe restaurant and watchtower. The beautiful and eye-catching giant city flower -- Bauhinia blakeana or Hong Kong Orchid Tree - which sits on the inclined roof at the tower tip attraction the attention of passers-by. 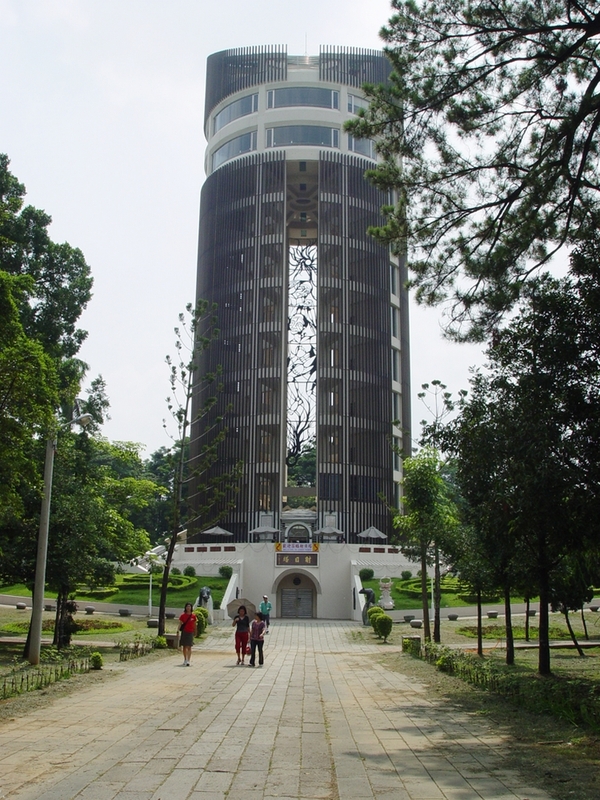 Visitors can enjoy a panorama view of the entire Chiayi City from the tower top and appreciating the picturesque scenery of the mountain city at one glance. Nat'l Hwy 1 → Exit at the Chiayi Interchange → County Hwy 159 → County Hwy 159A → Qiming Rd..
Nat'l Hwy 3 → Exit at the Zhuqi Interchange → Linsen E. Rd. → Yuanfu St. → Minquan Rd. → Qiming Rd..
Take the train to Chiayi Railway Station, continue by Chiayi County Bus (Downtown Route No. 2) to Chiayi Park stop.